From the moment you arrive on the resort’s delicate, powder white sands you will be immersed in a fantasy of luxury, quality and style unique only to Ayada Maldives. Delight in the impeccable service and superb amenities of the seven indulgent restaurants, bars and cafes offering world-class cuisine to tantalise taste buds, the extensive 3,500 square metre ESPA Spa & Health Club to take you to a blissful level of relaxation as well as a kids club, scuba diving centre and an array of water sports. Revel in the exquisite culinary journeys and unparalleled service in a stylish yet casual atmosphere at the resort’s three enticing restaurants, which showcase diverse international cuisine that draws on many influences; from Mediterranean specialities to exciting Asian flavours. Admire the perfect sunset amongst the ocean villas from the resort’s unique Wine and Cheese Island, where you can sample an extensive selection of quality wines or indulge in the exotic flavours and aromas of speciality coffees, teas and shisha in the authentic Turkish Cafe. The Pool Bar is the right place to be, if you seek a vibrant atmosphere, where you can relax during the day and hang out at nights, as the bar is transformed into a dance venue for the evenings, with joyful entertainment. 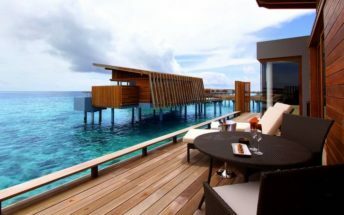 effects of water united with healing earth elements at the exceptional 3,500 square metre nirvana of the Ayada Maldives’ ESPA spa, designed leading spa experts. Along with eight treatment villas, the spa also offers a private Hammam, steam room, sauna and hydro bath. The cool relaxation lounges and health bar complete this private sanctuary of calm and tranquillity.